Noel Hunt has backed Pompey to overcome their recent blip and earn promotion from League One. The former Blues striker reckons the club has ‘the perfect mix of fans, players and staff’ to reignite their Championship charge. Fears of a play-off finish have grown among sections of the Fratton faithful following Saturday’s 1-1 draw at Plymouth. The stalemate extended Pompey’s winless streak in the league to five games as they lost further ground on the top two. 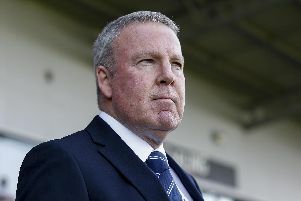 However, Hunt feels Kenny Jackett’s side have hit a sticky patch that every team with designs on promotion suffers at some stage over the course of a season. In fact, it’s something he experienced during his time at PO4. At the same 31-match stage of the 2016-17 campaign under Paul Cook, Pompey sat fifth in League Two – six points off the automatic promotion spots. Yet, the Blues would go on to win 11 of their remaining 15 fixtures and be crowned champions on the final day of the season. Hunt, currently assistant manager at Swindon, stressed both the supporters and players must keep the faith in Jackett. And the former Republic of Ireland international believes Pompey have enough experience to recapture their best form and reach the Championship. Hunt told The News: ‘It’s good they have a lot of experienced heads there like Gareth Evans and a lot of boys who have been there before. ‘You can’t go through a season without having a sticky patch. ‘Hopefully, it is just a minor blip and they’ll go up to the Championship at the end of the season. ‘Look at Liverpool. They were seven points clear in the Premier League a few weeks ago and that’s just football. ‘Throughout a season, whether it be because of injuries or form, it’s inevitable you go through a sticky patch. ‘The main thing is the fans stay calm and believe in what the manager is trying to do. ‘The boys all have to stay on the same page and know what they have to do. ‘I’m sure Kenny has them well drilled and he has great experience in League One. ‘Pompey have got a great man at the wheel. The club overall has a perfect mix of fans, players and staff. ‘They’re all together and only going to go one way, which is up. ‘It’s important they all keep calm and keep doing the right things, keep doing what Kenny asks them. ‘Form changes very quickly and in football you unfortunately have to go through a sticky patch. The majority of teams come out of one together. Hunt joined Pompey in August 2016 after being signed by Cook. The former Leeds and Reading forward made 24 appearances and scored one goal on the road to the League Two crown. Despite leaving for Wigan the following summer, Hunt holds fond memories of his Fratton Park spell. And he feels the fans have a big part to play during the business end of Jackett’s side’s promotion push. He added: ‘Fratton Park is an amazing place to play, I loved every single minute. ‘So it’s important for the fans to keep creating the buzz on the pitch.